Why should you have the same items on the BBQ every year? This superior pack has a range of fine cuts that will not only taste fantastic, but are sure to impress your company. 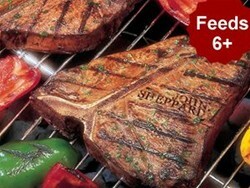 The flame grilled t-bone steak is a must for this summers barbeque. No related products for the Superior BBQ Pack 6+. No key features selected for the Superior BBQ Pack 6+. No quantity discount for the Superior BBQ Pack 6+. Be the first to submit a review for the Superior BBQ Pack 6+.